100 years ago, in 1869, Edwin West and Thomas Collier started the chair factory at the top of Frieth hill. The Firm started with one workshop about 20 ft. square. Besides Messrs West and Collier there were two other workmen. From this small beginning sheds and storerooms were added until finally the factory covered about two acres. As well as the workshops there were, on the estate, two houses, one occupied by Edwin West, the other first by Thomas Collier till 1916 when the Collier family moved to the Farm and Mr. West's younger son, Percy, moved into the house. There were also four cottages lived in by workmen. The workmen mostly came from the village, where at that time a number of cottages were owned by West and Collier, and let to the men at rents of one or two shillings a week. One man, a carpenter, lived at Ibstone for a time. From there he rode to work on a "penny-farthing" accompanied by his terrier who also rode on the bike. A lot of the men started at the Firm when they left school and went on to become skilled workmen. Women were also employed, working in their own homes matting chair seats or making kneelers. At first only chairs were made, later other types of church furniture were produced. seen in the Chiltern Open Air Museum in 2008. To begin with, until the Firm became known, West and Collier would take a cart load of chairs to a town, usually Reading, and sell them. When orders came in journeying round to sell came to an end. The chairs made were sent to Marlow Station by horse and van to continue their journey by rail. When the factory started all the work was done by hand. Later various machines were added, these being powered by engines. The first of these was a steam engine of the Rocket variety. This was purchased from Staines, from whence it was hauled to Frieth by horses. It was filled with water and stoked by an old man who on one occasion did his work so thoroughly that it had to be hastily cooled by my Father throwing buckets of water over it to prevent a fire. It was the whistle of this engine that announced to the Village that the first World War had ended. We were at dinner on November 11th, 1918 when at about 12.30, the schoolmaster, Mr. Derry, rushed to the window to tell Father, he jumped out of the window and rushed to the engine and blew the whistle till he had used all the steam. Mother told us that he was blowing it to tell people that the War was over. To go back to the beginning, when all the work was done by hand it may be of interest to give an account of the making of a chair. The timber was felled in the woods which surround Frieth. The logs were cleaned of their branches and sawn into suitable lengths. They were then loaded onto the timber-wagon and drawn to the Firm by two horses. The trees had been felled in the winter whilst the sap was down. Felling a tree near Frieth. The man with his back to us is holding a two handed saw similar to the one in the picture below. Arrived in the yard some of the logs were sawn into planks by the pit-sawyers. There is a saw-pit, oblong and brick lined, in one of the sheds. The log was cleaned of its bark and rolled over the pit. To saw, one man stood on the log whilst the other was in the pit, where as the work progressed, he got covered in saw-dust. They cut the planks by pulling and pushing a "cross-cut" saw. The planks were stacked in the yard to dry for at least a year. When properly dry they were marked, or to use the correct term "laid-out" , ready to be sawn into chair parts. Men with bow saws did the cutting. There was a shed with three hinged flaps at bench level, through which the planks stuck out into the open, being drawn in as the work progressed. The planks were laid out for "back legs" , "stays", these are the slats in the back of the chair, and "tops", the top of the back. These parts were made of Beech wood. The seats were of Elm. Sometimes, for special orders, the whole chair was made of Oak. After the parts had been sawn to shape they went to the Benchmen to be smoothed and finished. The tools used for this were Plane, Spoke shave, Scraper and Sandpaper. The finished parts were stacked on outdoor drying racks for a month or so, then taken to the drying-stove to finish off before being used. The test for dryness was to tap two parts together, dry wood gave a different sound from damp. The seats were made by the "bottomers" , the name for a seat being a bottom. The slab of elm, cut to the size of the seat, was shaped by a bow-saw. It was then put between blocks on the shed floor and wedged firmly. The slab was then hollowed with an "adze". This was a skilled job as too much or too little being removed would produce a misshapen seat. The man stood astride in front of the seat and swung the adze towards him between his legs. Having thus obtained the shape the bottom was finished on the bench with spoke shave, scraper and sandpaper. The round parts, Fore-feet "Pigs" and "Lists" were made by the Turner. They worked in a long earth-floored shod , half of which was open fronted, facing the yard where the logs were unloaded. The tools used by the Turners were, Cross-cut saw, Beetle and Wedges, Axes of various sizes, Draw-horse and shave, Pole-lathe and Chisels. 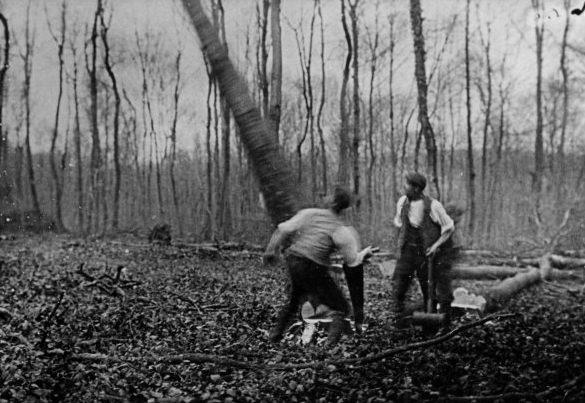 The Turners cut the logs into suitable lengths with the Cross-cut saw. The bark was removed by scraping with the small axe. 'Then the log, about eighteen inches or two feet high, according to the type of "leg" required, was placed on a low chopping-block and split into sections, fat or thin as required for the "leg" to be made. The split was made along the grain of the wood, using Beetle and wedges. These sections were rough and angular. They were stacked beside another chopping-block, this one of a convenient height for the man to work without bending. With his small axe he took off all the edges getting the leg almost round. It was further smoothed with the Draw Shave. Thomas's initials on the handle. The Turner, wearing a leather bib to protect his clothing from wear, sat astride the draw-horse, clamping the leg into position in front of him by pressing with his feet on a bar he smoothed the leg with his draw-shave, a blade set in wooden handles. The work was finished with chisels on The Pole-lathe. The Pole-lathe was made from a green sapling the thick end of which was fixed to the roof. It lay parallel to the roof, at right-angles to the wall, the thin end had a line attached, the other end of which was tied to a treadle on the floor. In front of the Turner, at about chest height, was a frame with metal points at each end to hold the leg in position. Before screwing the leg into position a twist of the line was wound round it. By pressing on the treadle with his foot the Turner whirled the leg round. He shaped it with chisels throwing water over it from time to time to keep it cool. Watching a chair leg from rough wood to the finished article was to me the most fascinating part of chair making. The finished legs went through the same drying process as the other parts. The dry parts were taken to the framing sheds for assembly. Tops and stays were first assembled and glued. Next two back feet were marked for boring and mortising, the boring was done with brace and bit to take the laths below the seat. The mortises were done with chisel and mallet to take the stays and top. The backs after being glued and nailed, went to the Framers for final assembly. Four men worked in the framing shed, each having his own bench and "block'", the latter a solid lump of tree trunk, about five feet long and three wide, levelled on top to make a flat working surface. Next to be made were the fronts. Two forelegs, one "Pig" and two or four "lists", according to the pattern being made, were needed. A back was laid on the block and bored to take the lists and mortised for the seat. The front and back were glued together and the chair was ready to be seated. The chair was placed on the block, the tops of the forefeet rubbed with chalk and a seat laid on and firmly tapped to get chalk marks where the holes were to go to take the legs. The bottom was glued and nailed into place and the chair tested to make sure it stood level. The glue used was heated in an oven in the drying stove, in which the men also heated their cans of tea for the morning and afternoon tea-breaks. At break time the smokers went into the road to light-up, no smoking was allowed anywhere on the Firm, the fire risk with wooden tarred sheds being very great. The men sat on the bank or field fence opposite for their smoke. The tarred sheds of "The Firm"
If the finished chair was to be left in natural wood it went to the packing loft, there it received a final "Levelling" test, any unevenness being carefully corrected. A chair to be coloured went to the staining shed where it was dipped in a tub of stain, either walnut, oak or green. Chairs, after staining dried best in the open air, and were stood around the yard. I have often seen a row of them stood out in the road to get the full benefit of what the old polisher called "suner wind". When dry the chairs were taken to the polishing shop. This loft had to be kept hot or the polish chilled and developed white spots, it was heated by a "tortoise" stove. The polish was applied with a brush. Some chairs, after staining, were finished by a rub with a rag dipped in oil instead of being polished. Over in the packing loft the chairs were made ready for transit. They were tied in bundles of four or six, the polished ones first being packed in twists of rye straw. The bundles were loaded onto the van to be taken to Marlow station by one of the two horses, Prince or Violet. This journey took about five hours, there and back. They left as soon as the carter had finished his dinner, about 12.30, and got back at about 5.00 o'clock. If it was a Friday the carter would collect the cash for the wages on Saturday. If the chairs were for export they were made up without glue or nails, except for the back which was finished. In the packing loft the chairs were numbered. All the parts of one chair received the same number, this ensured that the chairs would be re-assembled correctly. After numbering the chairs were knocked to pieces, each group of chair parts going into a separate heap. Each heap went into a packing case containing glue, nails and a few spare parts as well as instructions for assembly. Each case contained 30 or 40 complete chairs. The cases were nailed and hooped with iron bands, stencilled with the address and loaded on the van to make the first stage of the journey. The chairs to receive a rush seat had a frame instead. of a solid seat. They were taken to the cottages of the women "Matters" with bundles of rushes which grew in Holland. Sometimes the women fetched the chairs themselves, returning the finished ones. Often the men would take them when they went home. After 1920, when we had our first car, Father would take the chairs and rushes to the women who lived a distance away from the Firm. The rushes had to be damped before being worked. The woman sat on a low stool to work. She took several rushes and twisted them into a rope which she fastened to one corner of the frame. She worked round and round, from corner to corner, adding more rushes to the twist as needed. The hole in the middle slowly filled until the mat was complete. Then the chair was turned over and the mat stuffed with odd pieces of rush to make a firm, soft seat. The women usually came to the Office on Saturday morning to collect their earnings. The number of men working at the Firm varied. Two were employed at the start in 1869. In the 1920s I can remember about 30, my Father and Uncle were also actively employed as well as dealing with administration. There were three men in the Turner's shed. Will Latham, that good man of whom I have so many happy memories, Fred Bond and "Ike" Butler. The planks were cut into parts by Tom Brown, The Benchmen were Will Janes and his son Albert, Will White, Harry Poole and Jack Sherwood. Tim Tilbury assembled the backs , The Framers were George Higgins, Robert Higgs, Arthur Brown and Arthur Austin. The two sons of George Higgins came to work when they left school. Toby Poole was the polisher. The big frame saw was looked after by Ralph Busby with the help of a boy. These changed often as a boy starting from school often began by helping Mr. Busby, Two I recall where Cyril Ansell and Willy Davis. There were a number of men working in the Mill on the machines. Mr. Allen was foreman engineer. Alfred and Ralph Plumridge worked there also Bill Edwards, Stanley Janes and Percy Simmons. There were others I cannot recall. Up the ladder in the Carpenters' shop there were four men. "Gaffer" Atkins, Fred Atkins, Mr. Simmons and Kenneth Hobbs. In the Carving shed Mr. Hussey, that master craftsman, and Dennis Latham. During the 1914 war a few women also worked in that shed on aircraft spars and toys. I recall two, Miss Cue, afterwards Mrs. Fred Bond, and Miss Bond. The two horses were cared for and worked by George Edwards for many years carter , He was followed by Mr. Taylor. My Uncle did all the drawings for the carvers to work from. Before 1912 the Firm had an Office and showroom in London near Covent Garden. This was looked after by my Father and Mr. A. [ Archie ] Collier. After the showroom was given up my Father went to London regularly to see customers, visiting the Church furnishing shops and dealing with any business. Before he had a car to get him to the station he had to cycle, carrying his case of papers and often a couple of sample chairs as well. The prices of the chairs shown in the catalogues of the Firm look quite fantastic these days. In the last catalogue printed around 1930, a simple Church chair with a rush seat cost 1/10. 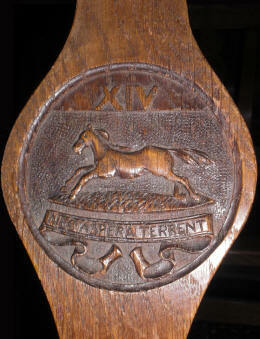 The Church chairs ranged from.£1.2.0 to £2.12.0 per dozen for the commoner designs. Wooden armchairs cost from 7/6 to 12/0 each. The Hall chairs cost from £1.7.0 to £2.2.0 a dozen. These prices were for plain wood, 6d or a 1s was added if the chairs were to be stained and polished. From 1912 until 1916 my Father ran a small chair factory of his own at Moor End. There were three sheds and he employed 4 or 5 men. In 1916 Mr. Collier took over the Farm, moving to the Farmhouse. The Moor End factory closed and my Father and the men moved up the hill to join the Firm. I have happy memories of that little factory at Moor End, it was my home for the first eighteen months of my life. It was there I saw an unforgettable sight. On a Sunday morning I was playing on the back doorstep when over the house floated a balloon with a man in its basket. As he floated over our garden he called to Father who stood looking at him "Where am I?" Father replied "Lane End, Bucks" The balloon went rapidly away in the direction of Lane End. Before I was born there was a great storm, Mother and Father often spoke of what evidently was a terrifying experience. Mr. Edwards had gone to Marlow with a load of chairs. The gale and snowstorm started as he was coming back, he was facing it all the way. By the time they reached Moor End both he and the horse were nearly dead, they both needed rest and treatment before going on to the Firm where they both lived. 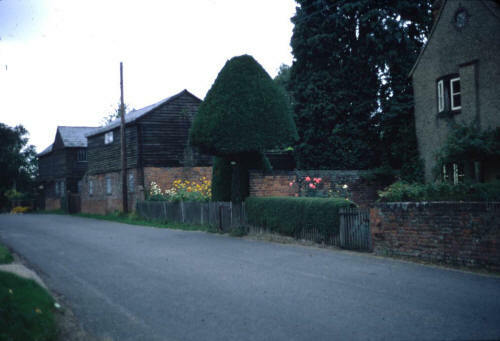 One of the sheds at Moor End started as a small Church at Woodend , in Medmenham parish, from there it was taken to Hambleden and for a time was the Scout Hut. Father bought it and it became a workshop at Moor End. When the factory moved to the top of the hill the shed went too. At the Firm it was enlarged and used as the carving shed. In 1940 it became the Frieth Guide Hut. Over the years machinery replaced hand sawing, but the chairs were always assembled by hand. The sheds, except for the polishing and carving sheds, were unheated. Most of them were earth-floored. They were all lit by oil lamps. Somewhere about 1928 came a great step towards modernisation, the lighting was changed to electricity. A small Dynamo was run by the engine that powered the machines, the current stored in glass accumulators in a dark, evil-smelling shed. The two houses were also lighted by electricity. At Christmas when the engine was off duty for a few days the accumulators were fully charged before the holiday. We were warned to use as little light as possible, but even with the greatest care, by the end of the holiday we had about one candle power of light left. Water was a problem in the days of the steam engine. The two houses each had their own underground tank, filled by the rain from the roof. Water in reserve was needed in case of fire too. To meet the need three huge tanks were dug to store water from the shed roofs, the water was raised by hand pumps. In 1921 we enjoyed a long dry Summer in which all the tanks dried up. A water barrel was borrowed from the Farm and. the Carter spent many hours daily fetching water from the ponds. Luckily at that time there were a lot around. I remember the joy when he fetched water from Moor End wood, the pond there had a splendid collection of "creatures". I spent happy hours with a net and jar fishing in the store troughs. The steam engine was a happy memory by the time the water mains arrived. By that time oil engines had taken over. The first, "Maria", ran on paraffin, her two successors on evil-smelling crude oil. Much beautiful work was done in the carving shop. The head carver was a great craftsman and artist, who, I am glad to say, handed on his craft at a school in Thame before his retirement. After the 1914-18 war, many memorials of great beauty were produced. One is in Frieth Church. A memorial to the Slocock brothers. A very lovely memorial is in the boathouse at Marlow. The war memorial Chapel in York Minster has a set of oak chairs, each in memory of a soldier, his name carved on the "top", his regimental badge carved on the upright stay in the back, each carving an exquisite work of art. West and Colliers' chairs went all over the world. I have a book kept by my Father, a record of the Churches and Cathedrals seated with Frieth chairs. Last year my sister visited. Norwich and Llandaff Cathedrals and found. the Frieth chairs still in use. Canterbury, Salisbury, St. Giles, Edinburgh, Wells and. Winchester are some of the Cathedrals which had Frieth chairs. There are also 850 still in use in Westminster Abbey. Many overseas Churches and Cathedrals had West and Collier chairs. Johannesburg, Khartoum, Sierre Leone, Newfoundland had them. The largest order for abroad went to the new Anglican Cathedral in Washington D.C. They had 3000, these were sent by instalments as the building progressed and was ready for seating. West and Collier supplied the chairs for the Lambeth Conferences. Each Bishop had his own chair, an armchair, which he took home at the end of the Conference. The factory closed. in 1940. The war made it difficult to get timber. It was also not possible for a small factory, doing mostly handwork to compete with the increasing mass production methods. When I visit a church I look for Frieth chairs, it is a great joy to find some and to look for the framer's mark on the back of the seat. Each man had his own mark, J.J., Jimmy Janes, R. H., Robert Higgs, A.A., Arthur Austin and a tiny circle with a cross in it, Arthur Brown, to mention a few.